The Drallim Group is an innovative technology driven British engineering company with global presence. With experience in providing comprehensive turnkey assembly & test solutions covering electronic, electromechanical, engineering and mechanical products we offer our customers a total contract manufacturing service. We are a leading innovator in design and manufacturing solutions, providing engineering skills, manufactured equipment & custom-built systems for the Aerospace, Industrial and Utility Markets. Leading Innovators. With experience in providing comprehensive turnkey assembly test solutions covering electronic, electromechanical, engineering and mechanical products we offer our customers a total contract manufacturing service. We are a leading innovator in design and manufacturing solutions, providing engineering skills, manufactured equipment & custom-built systems for the Aerospace, Industrial and Utility Markets. Drallim designs are driven by their Business Development team that are focussed in the Aerospace, Industrial, and Utilities sectors. We have maintained a significant presence in all these markets with military, energy provision and telecommunications service providers benefiting for our expertise. Drallim provide a complete design service our Electronics Systems team rely on us to design optimised product enclosures and customer interface hardware. Aerospace and Military application challenges are familiar Drallim, applications include securing helicopters and Passenger aircraft wheel servicing stations. Drallim Electronic Systems operate in tandem with our Mechanical Design team to meet the requirements and follow the guidance of Business Development to maintain our product range. Backed by our extensive design resources our dedicated Support teams are tasked with ensuring reliable and timely system installations. The Drallim Quality system drives any possibility of product improvement so that first hand feedback from the field is applied. Our teams can appear on site at short notice and liaise with office based specialists to set up and monitor system installations and data distribution. Customer led changes can be presented as e-mails, transferred to system change cases and implemented within minutes. Post design service agreements can be set up at any time to offer a cost-effective system expansion and maintenance facility. Drallim host customer database server to provide trouble free system maintenance and access. We can configure and support system servers, broadband Internet data access at a fraction of the costs of corporate IT providers. Our Engineers are equipped and trained to meet the most rigorous site requirements demanded. We have exemplary safety record that we strive to maintain by active support and investment in our Support teams. As a specialist UK based cable assembly manufacturer with over 40 years’ manufacturing experience, we are well-established as a reliable supplier of the highest quality cable assemblies and can produce a vast range of cable assemblies. Drallim has manufacturing experience that enables us to manufacture a diverse range of large multi-connector harnesses and looms, which are carefully assembled and laid out onto custom pin boards to ensure a perfect fit every time. Our flexible approach means we can supply quantities ranging from one-off prototypes, through to small and large run volumes. Our unique blend of experience in mechanical and electronic engineering means we can give practical advice for design and development. Due to our wide-ranging electrical/electronic cabling experience combined with strong supply chain management, we make an ideal manufacturing partner. In addition to calibrating our own products and instruments Drallim offer these services to complement Post Design Services and Support activities. High Voltage Electricity transmission cable test equipment is an example of an area of specialist calibration expertise. Drallim service and repair all their range of products. We can meet the challenges of obsolescence by offering updated assembly replacement, for example. Our commitment to customers is borne out by our ability to maintain the original performance parameters of products for decades. The Gast Group awarded its first Accredited Service Centre status to Drallim Industries. The award authorises Drallim to service, repair and refurbish Gast H Series compressors, which are used on compressor desiccator units manufactured by Drallim and supplied to British Telecom and on Drallim’s own range of Waveguide Dehydrators. The BVR20 Battery Voltage Recorder is a handheld device designed for measuring cell voltages and ambient temperature. The BVR11 can be used to measure voltage and temperature parameters when the battery is either online or offline. 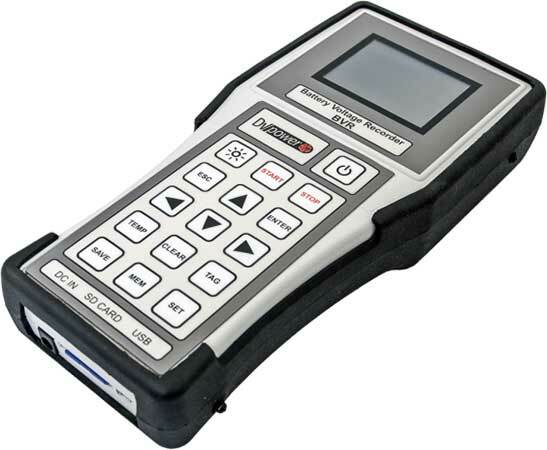 The BVR20 can also provide data on the density of electrolyte with the aid of an optional density meter (DMA35). An additional feature is the ability to tag individual cells for recognition over Radio Frequency Identification (RFID). Measured variables can be displayed in histogram form on the 2.8” colour display. 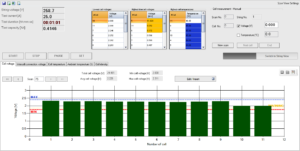 Data can be downloaded from the device using a USB connection and proprietary DV-Win software allows detailed data analysis of battery health. DV Power provides a 3-year warranty on all test instrumentation. This is a guarantee to our customers that they will receive the highest quality test equipment on the market. DV-Win software is included in the purchase price, and all updates are free of charge. The intuitive software facilitates in-depth analysis of test results which can be displayed numerically and graphically on a PC or within an automatically generated report. It is possible to export all test data into all mainstream file types. When this BVR device is used in conjunction with accompanying DV Power test units it is possible to use DV-Win to analyse cell voltage, string voltage, capacity and time as well as setting alarms and test termination times.